BY MARY COOK – Trains would come in carrying loads of ammunition, and there’d be armed guards on top of the train. They even built some barracks on the island. Patrol boats ran missions keeping track of the submarines we could see from the coast. Minesweepers worked the pass. These words spoken by late Darrell Polk about WWII drama on Boca Grande appear in the new book, “World Wars: Memories and Reflections of Boca Grande Families.” It will make its debut at the Poetry of WWII performance on Tuesday, April 11 at 7:30 p.m. in the Boca Grande Community Center Auditorium. The Friends of Boca Grande will host the event as part of the symposium, “A Closer Look at World War II.” For April 10, 11 and 12 symposium information, see the Ballyhoo. While the symposium features six famed WWII historians, the Poetry of WWII program features music from Grande Glee, readings and poetry from World War II. The show’s director is Tad Ingram, noted for his many years as a New York actor/director but also most recently here for directing Royal Palm Players’ production of Neil Simon’s “The Odd Couple.” Roger Lewis is the narrator. 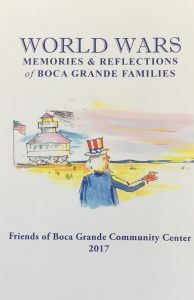 “World Wars: Memories and Reflections of Boca Grande Families” includes more than 50 wartime accounts submitted by islanders and compiled by Barbara Edgerton with editors Sandy Ross Jacobs and Debbie Frank and layout designer Jessica Smith. Artist Peter Diebold’s cartoons are sprinkled through this new volume, which is available at the Community Center for $20. Grande Glee, under the direction of Sharon Ponte, will perform a musical rendition of islander Michael Alexander’s poem, “The Legacy of War.” The familiar voices of Michael Alexander, Joan Ardrey, Alice Court, Carol Elwood, Oakley Johnson, Julian Keevil, Joan Kulukundis, Erica Ress Martin, James Martin, John Moenning, Linda Rollyson, Elaine Skypala and John Thomas make up the chorus. Tickets are available at the Friends of Boca Grande office located at 131 First St. W. or by calling 964-0827.